John L. Stevens and W.B. Oleson : Surf Riding, 1894-1900. Stevens, John L. and Oleson, W. B.
luxurious productions, beautiful cities, corrupt monarchy, revolution, provisional government and annexation. Photographs by Nellie M. Stevens. Edgewood Publishing Co , Philadelphia, 1900. 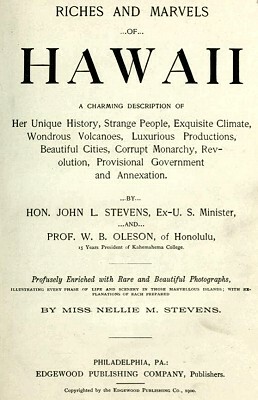 First published as Picturesque Hawaii, Hubbard Publishing Co., Philadelphia, c1894. 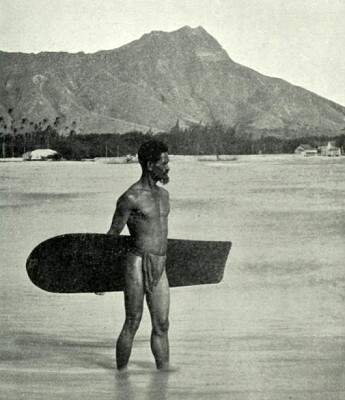 The book includes an often reproduced black and white photograph of a Hawai'ian native holding a surfboard and wearing a malo (loincloth) on Waikiki Beach. Here, according to the text, the image is accredited to Nellie M. Stevens. Tim DeLaVega estimates the photograph was taken circa 1893 and suggests it may be the work of Frank Davey and the surfer, Charles Kauha. Davey took several photographs of Kauha with his surfboard at Waikiki in April 1898, although none of him surf riding. - DeLaVega: Surfing in Hawai'i (2011), cover, Frontpiece, and page 32..
Oleson, W. B. (William Brewster), 1851-1915, 15 Years President of Kahemahema College. It is the stereotyped thing for tourists to snap ten-cent pieces into the water, and watch the boys dive for the money. They never fail to get it, and on some occasions a particular boy will have quite a mouthful of dimes before the steamer gets fairly under way. Sometimes sharks come into Honolulu harbor, but the natives always manage to know when a shark is about, and they rarely get caught. The shark must turn before he can snap at his expected victim, and just as he turns, the native dives, and the great jaws come together with nothing between them. This is repeated till relief comes, much to the perplexity of the clumsy fish. usually wins the day, either by killing his foe or by driving him off. It was formerly practiced in honor of kings and chiefs, but is on its own account a right royal sport, in every sense of the word. It consists in riding a long plank, carefully shaped, and with ends rounded, on the crest of great billows rolling shorewards. surf-board in such relation to the movement of the billow that the latter will propel the rider at a tremendous speed toward the shore. Expert surf-riders will rise as they rush along, until they stand erect with folded arms, complete masters of the waves, whom they seem to drive before them like horses in a race. Surf-riding, though not so frequently witnessed as formerly, is nevertheless yet to be seen on special occasions. The exciting pastime of surf riding is enjoyed by both sexes. a foot and a half wide. 15 Years President of Kahemahema College. BY MISS NELLIE M. STEVENS. Copyrighted by the Edgewood Publishing Co , 1900. Geoff Cater (2012-2017) : L. Stevens and W.B. Oleson : Riches and Marvels of Hawaii, 1900.